Good job manisha. You made 4 little girls happy thats what matters and your skills do not look bad at all :D. I have tried my hands on henna designing sometime back and every time I messed up, so now I am sure it is not my cup of tea :). Thanks for stopping by. I'm an old visitor to your blog because I think it rocks - not just the food but the prolific writing, as well. And we have 8-year-olds in common! P.S. Your pinwheels look very tempting - perfect for a lunchbox treat. oh Manisha, you are so talented! 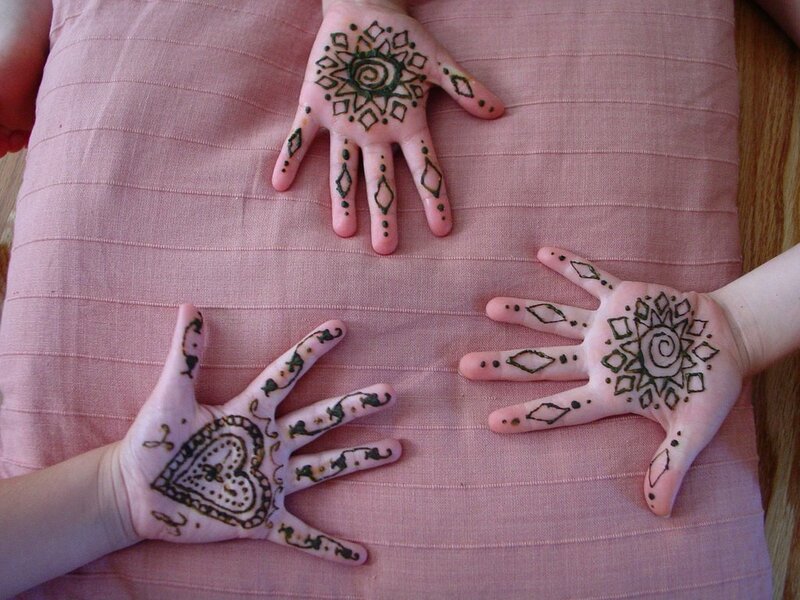 The henna patterns are beautiful. Lovely post! Shilpa, that's how I told myself! I had 4 very happy little girls. Apparently, you can get better with practice. It might be a good activity for winter, too, when the girls are cooped up inside on cold days. 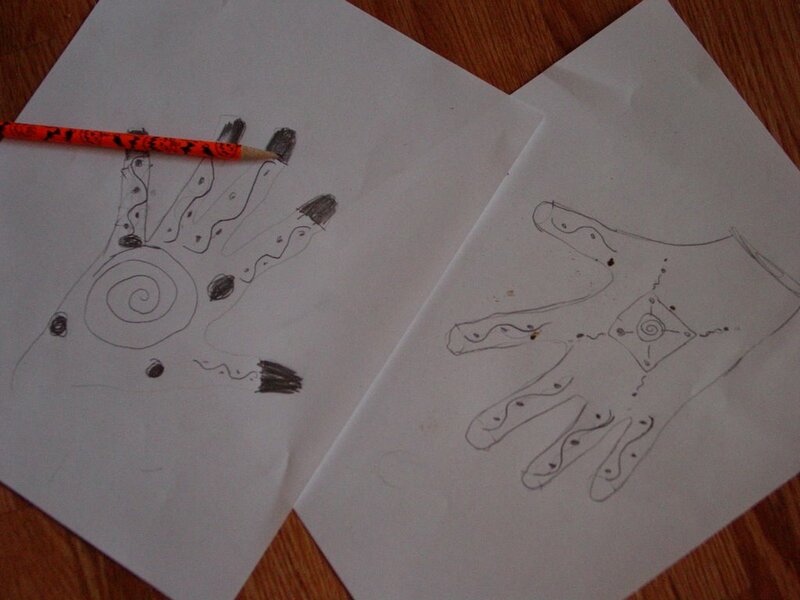 Put out a large plastic sheet, dress them up in old clothes, and let them make patterns on each other's hands. I hope I have the courage to let them do that! Terri, I'm a total fan of your blog and I simply adore the persona you use to write! It's great to have you here!! SH, thanks but I am not very creative! One of the reasons I went along with this activity was that I was running out of ideas that did not include TV, movie or computer. I've missed you and your beautiful posts. Welcome back! 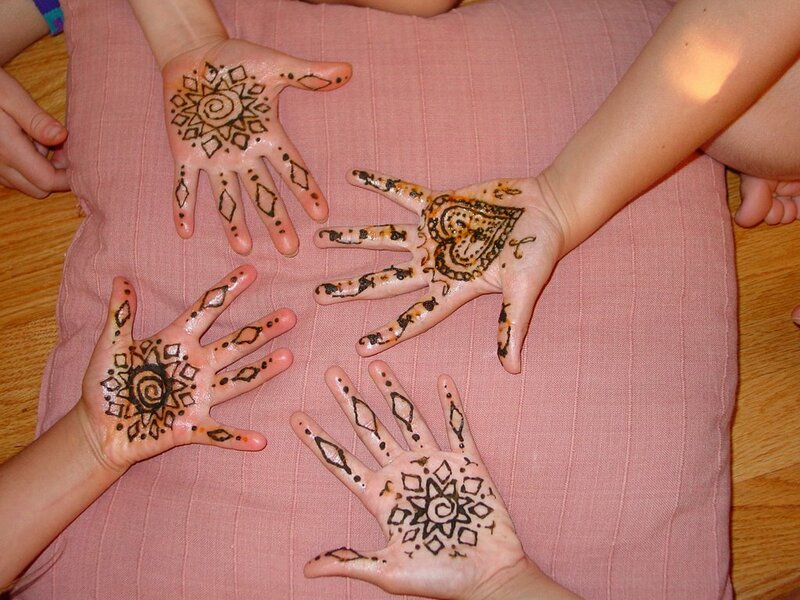 I love your stories of entertaining the kids - the henna looks wonderful! Kudos to you. I am sure you 've had a great fun....designing with henna. Fantastic Manisha,You have done a great job with the henna. The only good thing I can do with henna is plaster it over my head every 2 weeks. Shankari, no streak, not even a hint. Really! This post was to share an activity that was lots of fun for the girls. I did get permission from their parents before we started. 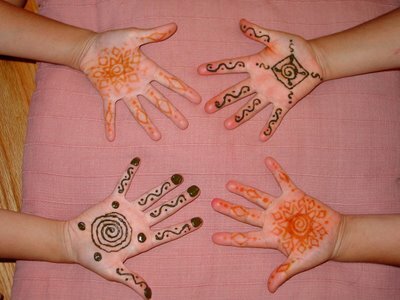 Except for one child, everyone knew about henna tattoos because you can get them at the Boulder Creek Fair every year. Linda, I tried my best. The lines are supposed to be thin and consistent. What I have drawn goes from thick to so thin that it's difficult to see if it's a line! Medha pulled out some stencils that her Dad brought back for her from India last year. She's going to practice free-hand drawing with those (and make me do it, too) and then maybe we'll do a little better! Lera, we had a lot of fun despite my clumsiness with the whole thing! Anupama, I used to do that a lot in India. It has such a wonderful cooling effect! L2C, your story reminds me of a friend's. He is from Rajasthan and in his community, the bridegroom also has mehndi drawn on his hands. When he returned to the US after his marriage, he had a real tough time because his finger nails were colored a deep orange from the henna. And while the color fades from the skin over a couple of weeks, his nails remained 'painted' for longer! He is a speech therapist and so he couldn't hide behind his computer or in his office till the color faded. What fun! Lovely designs on the lovely little hands, too. These times are the best memories, no? Years later when she's fiddling with a ziploc bag I'm sure she'll suddenly remember all this fun. Hey! You're back from India! Yes, you're right about the memories. Which is why I said your red crocheted tunic is precious! It is a very nice idea to put henna on thier hands. Those little hands look so cute! Manisha,it looks so wonderful on those cute lovely hands...u really rock dear!! 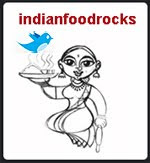 Bindu and indianadoc, thanks! They want to do it again before school starts but I think I'm going to save this for a long weekend instead. 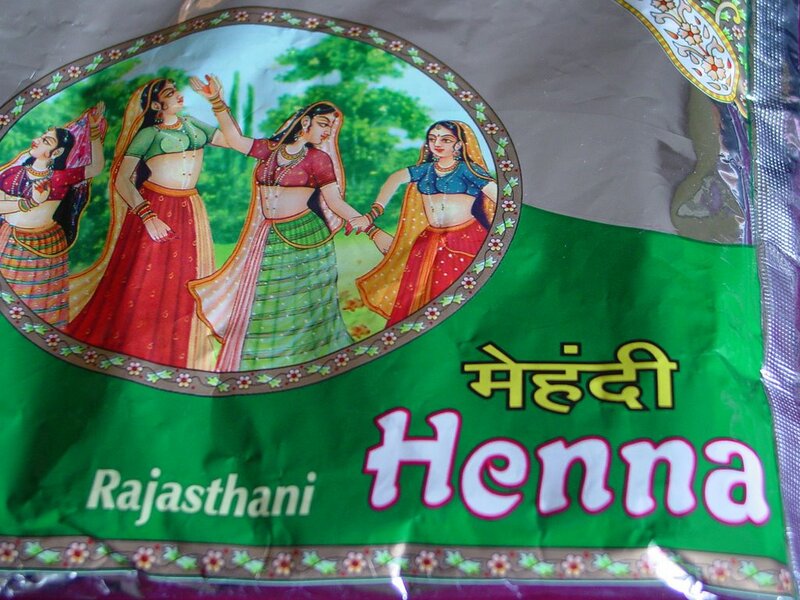 Manisha--you are too hard on yourself--the henna looks great on the girls! The lemon and sugar dab is done -after- the henna starts to dry a bit, so it doesn't smudge. The purpose of it, as I understand it, is two-fold--the acid in the lemon activates more of the dye in the henna, while the sugar helps form a sticky crust on top of the henna paste to make it stick to the hand longer so a better dye set is achieved. I love henna, and only wish I was better at applying it to myself than I am. If I were, I would probably have henna designs on my hands and feet most of the time! Barbara, welcome! The girls were thrilled and are waiting for the 'next time.' You're right about dabbing the lemon-sugar mixture after the henna dries. The henna looked dry but it was still wet on the inside. It's probably the dry Colorado weather and I should have waited a little longer for it to dry completely. Next time! That's what so great about doing this with little girls - they didn't mind all the mistakes I make! They have a blast regardless!